There is a stirring in America today: a silent but steady ebbing that can be found on the outskirts of the mainstream, progressing steadily to the forefront of our daily lives. In attics, garages, basements, warehouse spaces, and barns across the country, men and women are rolling up their sleeves and eking out a living through sweat and persistence. As Generation Y begins to stabilize their footing and establish their influence in society, they have started to rebel against generic, mass-produced, disposable goods in favor of unique, artisan built, quality pieces. We have seen this rebellion overlap into the world of motorcycles over the past four to five years. Guys are finding burned out heaps of Japanese steel, rusty relics from a bygone era, and they are spending late nights busting knuckles and breathing life into these forgotten machines. One does not have to look very hard to notice that the major players are paying attention. Triumph, Ducati, Honda, Harley-Davidson, and Moto Guzzi are just a few who have been cashing in on the “Modern Classic” movement. In an effort to outfit this modern culture of café racers and do-it-yourself wrench junkies, motorcycle apparel manufacturers have begun to produce offerings void of flashy labels and extreme race cuts. Stylish leather jackets that will compliment ones hooligan ’71 Moto Guzzi Ambassador as well as their favorite pair of worn out 501 Levis as they sit at the pub drinking pints of PBR on a Saturday night. Rev’It! has three new jackets being introduced this coming Spring that will fit nicely with this new cultural shift in motorcycling. The Roamer, Redhook, and Flatbush will encompass Rev’It!’s new line of Retro Jackets. The idea behind this line is to give riders a jacket that will offer exceptional protection while they are on their bikes as well as to serve as a fashionable option when they are not. All three offerings will feature premium full-grain cowhide, low slung snap collars, short connection pants zippers (as well as a jeans loop) and a non-race city fit that will work as great on a caféd out ’76 Honda CB550 as it will on a modern Harley Davidson XR1200. The first option in this new family from Rev’It! is the Roamer. This is going to be the only jacket of the three to offer a full-sleeved, removable, thermal liner, thus offering the most protection from cooler temperatures. It features Max Cowhide, which is very soft and flexible while still providing fantastic abrasion resistance in the event of a crash. There is Knox Flexform CE armor in the shoulders and elbows, reflective strips on the back, and it is ready to accept a Seesoft CE-Level 2 back protector (Type RV). The REV'IT! Roamer Jacket is only available in black because anyone who plans on having their hands covered in grease has no need for color options. While the Roamer is slick and refined the REV'IT! Redhook Jacket is the Black Sheep of the family. 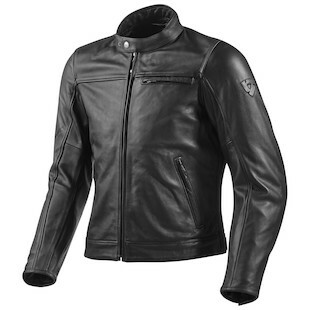 Featuring embossed Arizona cowhide, the leather in this jacket is heavy and rough to the touch. This type of leather processing will allow it to be extremely abrasion resistant while maintaining its original look and feel even over years of abuse. The Redhook uses the same Knox CE armor found in the Roamer and is set up to accept the same Seesoft back protector. A removable thermal vest comes standard and a diagonal left breast pocket sets it apart from its two siblings in this lineup. Available in Black or Brown, the Redhook could easily be mistaken for a relic left behind from an era when Hollywood actors rebelled against studios by spending their free time racing cars and motorcycles under the California sun. Completing the sibling rivalry among these three brothers is the REV'IT! Flatbush Jacket. Pulling out all of the stops in its effort to steal the spotlight, the Flatbush features Pull Up Natural Cowhide. Pull Up leather is not a specific type of leather but rather it refers to a specific tanning process that allows the leather to break in and age very easily. Of the three it features the most sophisticated CE rated Sas Tec Armor, which surpasses standard CE testing by 50%. 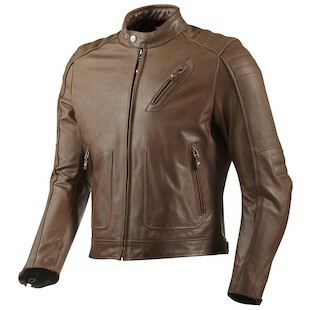 The lack of liner and the breathability of the Pull Up cowhide will make this jacket ideal for use in warmer climates. 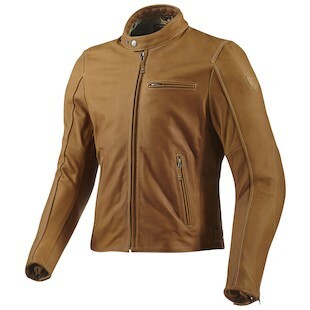 Available in a Dark Brown or Camel offering, this jacket is a stylistic option for the rider who appreciates the fact that good things come to those who wait, just not when the light turns green. In 1974, Peter Allen sang, “Everything which is old is new again” and almost 40 years later these words still ring true. These three jackets fit nicely into this current trend of “modern classics”. Almost completely void of logos, these simplistic designs pull on the heartstrings of the past. Whether it is a new machine built to create a whiff of nostalgia or a 35-year-old forgotten shell of motorcycle that is begging to be reborn, there will always be boys and girls willing to ride and rebuild them. As long as the world has motorcycles there will always be a need for leather; because there is nothing else that looks as good in the garage, or on a barstool, as a vintage leather jacket.